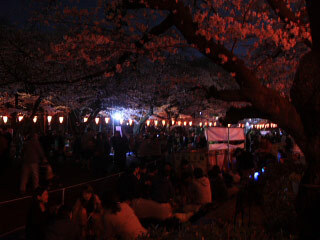 Yozakura at Ueno Park (上野公園夜桜) is one of the best way to enjoy Sakura at Night. Ueno Park is located in Ueno, Tokyo. It is one of the most popular Sakura spot in Tokyo. There are 800 Sakura trees that bloom in early April. On the weekend, people gather here and have hanami party. The light of lanterns keeps until 8pm for night party as well. It is called Yozakura. Sakura of Ueno Park is one of the most popular and famous in Kanto region. There are about 800 Cherry blossoms in Ueno Park. They will bloom mostly from the end of March to the beginning of April.